Now that I have had some time to decompress, I can look back at my great time at the All Candy Expo and share with you what was going on and what I felt really stuck out in yumminess. The whole Expo just seems overwhelming by nature. I mean, when the three of us met in the press room, there were at least a dozen different products that were “all you could take” just waiting for us to grab, conveniently place by an “all you can eat” ice cream freezer, and this is all in addition to the messenger bag of goodies we got when we signed in. When I got the job writing for this site, very nearly a year ago, I was ecstatic. Iâ€™d have an excuse to try all kinds of exciting new candies and share my opinions of them with the world. Iâ€™d have a super-cool contract writing job that would also provide me with published writing samples for my resume. And maybe, just maybe, someday, Iâ€™d get to go to the All Candy Expo. Now, Iâ€™ve wanted to attend the All Candy Expo ever since I heard it existed (like many people, from the Food Network show Unwrapped and that episode of The Simpsons with the gummy Venus de Milo.) It seemed like such an unlikely and far-away dream for your average writer and Candy Addict. But in the end, it came true! 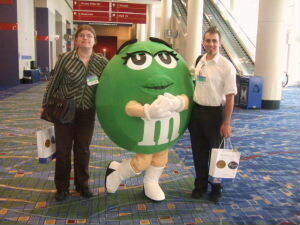 I met up with fellow Candy Addicts Robby and Caitlin at Chicagoâ€™s McCormick Center bright and early on Tuesday morning. I knew I wasnâ€™t in Kansas any more when, upon registration, I was presented with a big green tote bag â€“ filled with candy! The press room wall was lined with full-sized chocolate bars and candies â€“ Flings, Crackheads, and the new Skittles Crazy Cores and Fudge Snickers, to name a few. Robby and I immediately began to dig into the heap of freebies, which resulted in our being called newbies by expo veteran Caitlin. And, indeed, the sugar rush was only beginning. Stay tuned for reviews of everything we could get our hands on! This trip is a first for many things for me. It’s my first time in Chicago, the first time at an expo, the first time I met Caitlin and Laurie in person (both so awesome), and the first time I have ever wondered if there is such a thing as too much candy. I mean there is just a ridiculous amount here. After weighing my haul from yesterday, I came back with 38 pounds. 38! That’s like a small dog. And it’s only day one! Those were the big things I think you should know before anything else, and when I get home this weekend, I’ll write something in length and mention the noteworthy products I sampled and what else to look forward to. For now, it’s back to the floor and even more candy! Well, Day 1 of the All Candy Expo is officially over, so I thought I’d share with you the most amusing part of the day. At the Mars press conference, we got to see this very funny “public service announcement” featuring Neil Patrick Harris. It’s part of the Real Chocolate Relief Act we reported on a couple of weeks ago. Just to refresh your memory: from now until September, Mars is giving away 250,000 free coupons for full size chocolate on Fridays at realchocolate.com. That’s a total of 7 million bars of free chocolate! In addition, there will be special events at various cities, and some great savings on Mars chocolate at your local stores. So go check it out and enjoy some good Mars chocolate – still mockolate-free!